I can always find whole chicken on sale at my favorite supermarket so I always buy at least one for the week. 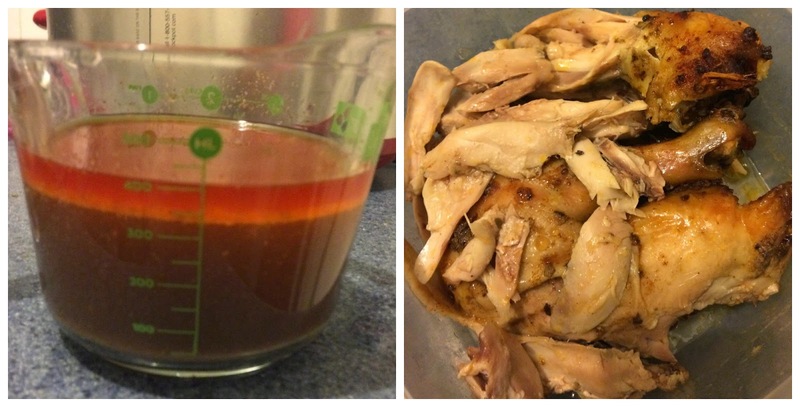 I love making whole chicken at home because it's inexpensive and with a family of 3 we always have left overs. Roasting chicken is always a hit or miss for me. Sometimes it will be super juicy and sometimes it will be super dry. I blame my temperamental oven! After hearing so many moms from my daughter's playgroup have success in cooking a whole chicken in the slow cooker I decided to give it a try. First I tried the method of balling up some aluminum foil in the bottom for the whole chicken to sit on. I found that it made my chicken too dry so I decided to put vegetables instead of foil. My chicken came out so moist and juicy and I didn't have to babysit the chicken by checking on it every half hour. All I had to do was set it on top of the veggies and then slathered it with my butter seasoning mix and cooked it for 5 hours on high. I was left with a delicious and flavorful broth that I will be making into a low carb soup (recipe coming soon!) and some left over chicken for my husbands lunch the next day. So dinner, lunch leftovers and a soup base cost me $3.31. Chop carrots and onion into big chunks and place in the bottom of the slow cooker. Squeeze lemon juice into a small bowl. Slice lemon in half and place in bottom of slow cooker with vegetables. Add butter and seasoning to bowl with lemon juice and mix well. Slather the butter seasoning all over the bird including under the skin of the breasts. Place chicken on top of vegetables. Strain and save broth for future use. Chicken is my favorite...this looks so good!!! That sounds delicious. Chicken is the one meat that everyone in my house actually likes LOL. 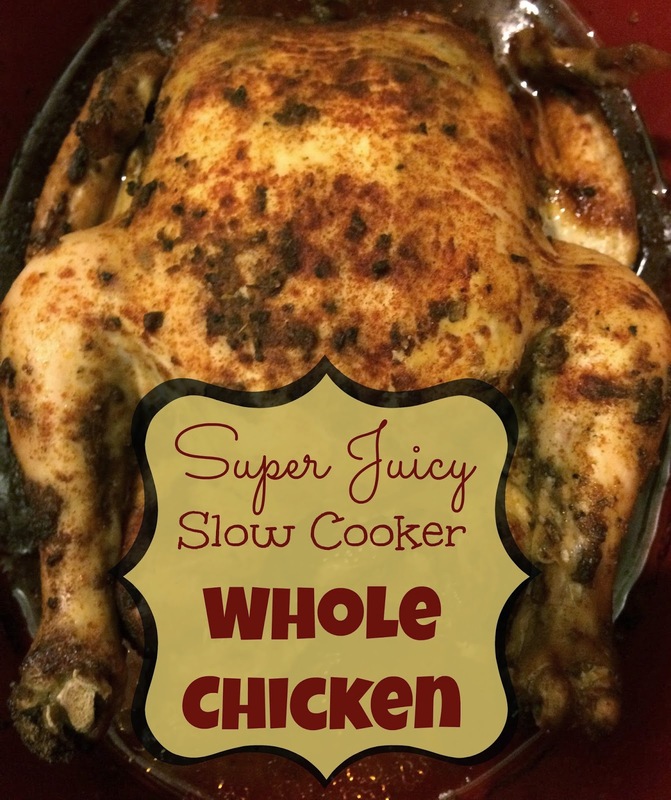 Can't live without my slow cooker...and LOVE making chicken in it! Definitely trying this recipe--- I've never made a whole chicken in it! Yum! 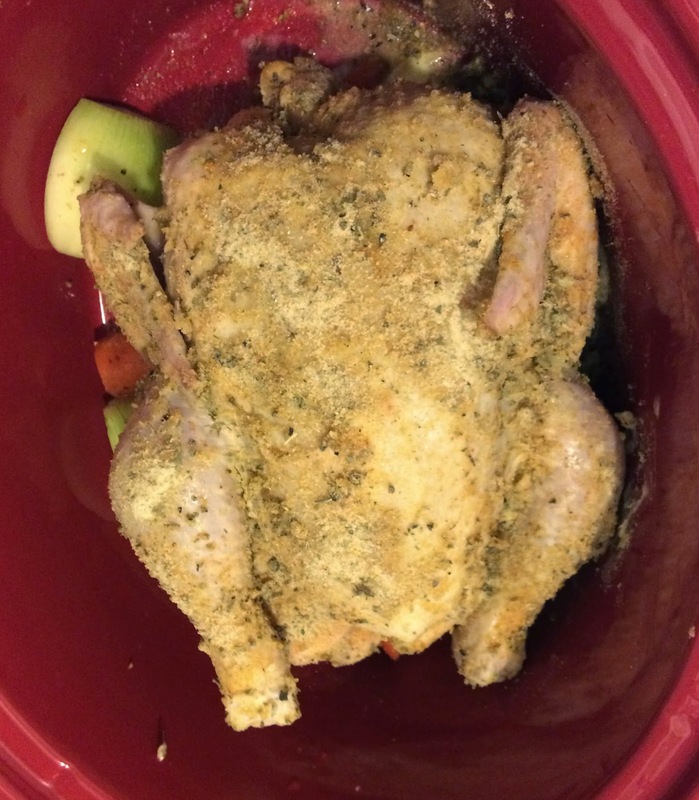 I've never cooked a whole chicken before in a crockpot. Seems like it would be tasty and easy! Slowcookers are great. I love it when dinner is ready for me when I get home! I just love cooking with the slow cooker. It makes everything taste so good, with so much less work. I love how easy it is to do in the slow cooker and with a liner, the clean up would be so easy. Thanks for sharing! Never made a whole chicken in the crock pot before. Looks amazing. Yum! I love that you used paprika and cracked black pepper. This sounds so good and the slow cooker makes it nice and easy. Nice work! This sure does look amazing! This looks like something I will have to try because I like getting the cooked chickens from the grocery store but hate paying their price. I tried this today and it was easy and really good!